AJ Spader asked his sister, Rebekah, to his winter formal at O’Gorman High School in Sioux Falls. 10-year-old Rebekah was diagnosed with myelodysplastic syndrome, a potentially terminal form of bone marrow cancer. After a bone marrow transplant proved unsuccessful, her family called off all treatments so that Rebekah could enjoy whatever time she had left. Her brother, AJ, wanted to take matters into his own hands. For AJ, that meant taking her to winter formal, which would be both Rebekah and AJ’s first dances respectively. As they sat for their interview, AJ’s parents expressed a wide range of emotions. They were happy that their children loved each other. They were proud that their son put aside social obligations on this special night in his life for his sister’s sake. But they were also sad that this was something Rebekah couldn’t experience at the same time as her peers. Even so, they were very happy that they could make this night happen for little Rebekah. 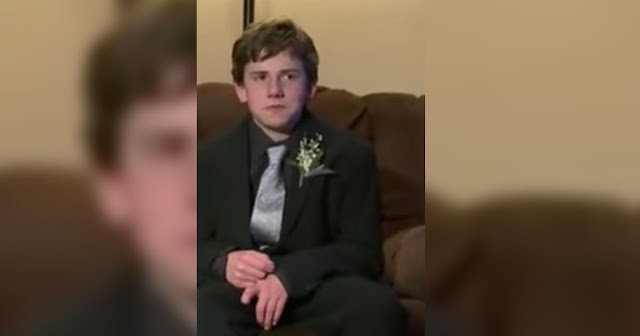 “He’s thinking about his sister and she’s not going to get to go to the prom or the formal when she’s in high school because she’s probably not going to make it to high school, so he just wanted to give her that memory,” said their dad, Tony. Extended family came to help with Rebekah’s hair and makeup, transforming her into a real-life princess. Her curly hair bounced over her shoulders covered with a sparkly dress collar. They did the whole nine yards. They began the evening by taking pictures of all the kids in their formalwear. Rebekah took center stage in nearly all the group shots. At the pre-dance dinner, the children all made toasts with faux-champagne and were excited at the big night ahead. It was a night to remember for everyone involved. AJ had said that he wanted “to spend as much time with her as possible while she’s still doing good.” It’s truly touching to see this family come together to make sure that their special girl has a lot of good times to hold on to. In life, it’s important to remember that even though bad things happen doesn’t mean the good things didn’t.